Sometimes you just expect directors to deliver a certain “type” of film – normally because they rightfully play to their strengths. Take Ridley Scott for instance. His movies have been from a wealth of genres, but have always had that “epic” nature to them. Scott doesn’t really do movies about introspection. Similarly, with Quentin Tarantino you’re not going to get a humourless, dull looking film – you’re getting full-on acting set in a very Tarantino-esque universe, regardless of whether it’s set in World War II or Japan. Along with this, you also expect a certain level of quality with the piece – more so if the director’s carrying several Oscars under his / her belt. So what happens when the director deviates from the path? Savages. 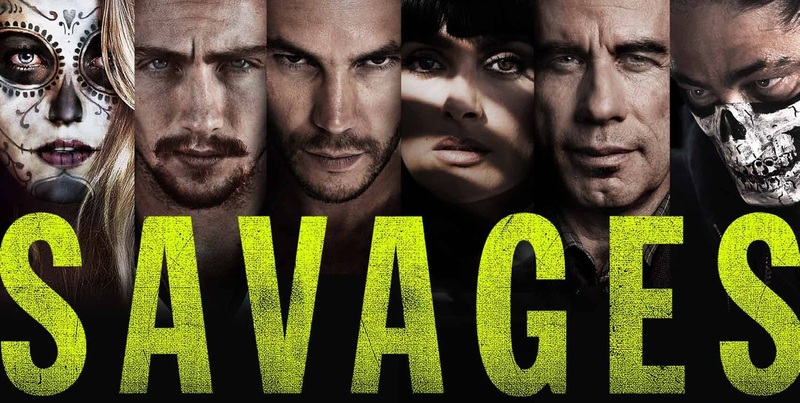 Savages comes from Oliver Stone – a three-time Oscar winner and writer of such classics as Platoon and Natural Born Killers, as well as a slew of politically-bent films such as W, Nixon and JFK. Savages deviates from this political bent (if taken at face value) to deliver a story about drug trafficking across the Mexican-US border in California. In a nutshell, two friends: one ex-US army (Taylor Kitsch) and one academic / botanist / hippy (Aaron Taylor-Johnson) find a way to make the best marijuana possible and make a fortune. However, the Mexican cartel headed by Salma Hayek and her lieutenant Benicio Del Toro want their share of this business. Oh, and John Travolta‘s involved as a corrupt Federal agent… Sounds like a great cast right? Sure, I can’t fault that, but the film just isn’t as good as the sum of its parts. The happy couple…. or throuple. The entire story is actually based on a book by Don Winslow, which I haven’t read, so I can’t comment on the film’s accuracy in this respect. The flaw for me was just caring about some of the characters, namely Blake Lively‘s “O”. “O” or Orphelia is the girlfriend of both Kitsch and Johnson – they both sleep with her and live with her in a very hippy-esque manner. Despite the fact that I imagine Kitsch‘s character John would never do this considering his general bad-mannered demeanour. He’d be more likely to kick your front teeth out if you accidentally glanced at his girl over a crowded bar. Now, it’s “O” that causes a hell of a lot of trouble for the boys in this film and I just found myself wondering why the hell they didn’t just cut and run. Her back story is muddled (mentions of an absentee mother who doesn’t care, yet she writes these loving e-mails to her is just one of these) and you just realise how vapid she is as a character. However, this isn’t the major thing that drew me to despair. No no, that came about 10 minutes before the end of the movie. I obviously won’t ruin it, but Oliver Stone whips out one of the most hackneyed and amateur ways to end a movie. I’m not even talking about the sequel-bating that most films offer, but something else entirely worse. I’m unsure if the original book does this or not, but if it does, then Stone shouldn’t have followed it to the letter. It’s horrible and incredibly frustrating. I actually found myself getting angry as it unfurled. Movies don’t often make me angry, but this genuinely did. It all goes along with the fact the movie seems to think it’s far cleverer and wittier than it actually is. For a start, it’s narrated by Blake Lively who gives the ol’ “don’t think I survive just because I’m narrating this…” – this isn’t witty. Hell, Kickass did this exact same thing two years ago. It also just came across like it was trying too hard to be something cool and pulpy like some of the modern day-set Tarantino movies. The sound effects, the editing, the cultural references. All just tried way too hard. 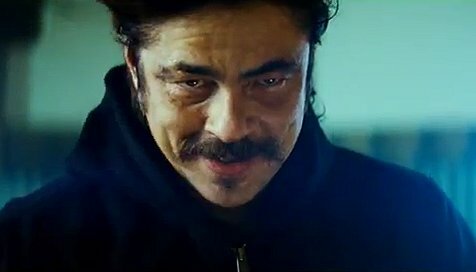 Benicio Del Toro: Reliably disturbing. Reliably brilliant. Having been so negative on the movie, I must commend some of the actors, especially the always reliable Benicio Del Toro. This guy oozes malevolence in every role he takes and this is no exception. It reminded me of just how great he was in Sin City and he yet again turns in a strong performance. The same is true of Aaron Taylor-Johnson (Kickass) and even Salma Hayek. I thought the tent-pole names really pulled their weight. It was also great to see John Travolta return to the cinema after a hiatus following tragedies in his personal life. It should however be noted that he’s only in 4-5 scenes, but he shines in them. I love the recent Travolta – anything non-campy past Pulp Fiction is grand with me. This performance reminded me most of Face/Off… just without the wild and whacky impressions of Nic Cage. For a two hour plus movie, I just felt the film was bloated. It had its great set pieces and some eye candy and I felt my interest rising throughout the second half of the film, but any enjoyment was completely obliterated by that hackneyed ending. After the credits roll you’ll be sat there wondering “so what… that’s it?”. It’s not frustrating for the right reasons, such as Killer Joe‘s cliffhanger, it’s frustrating because it’s just bad. Savages is a disappointing film, especially considering the great ensemble cast and some quality performances. At the end of the day, it ended up coming off like a video game’s script than anything else. Nothing against game developers, but you expect far more from an Oscar-winning writer than you do a story writer for Nintendo. And that ending? Good God that ending stank. So my advice remains that you should always play to your strengths. Sure, it’s fun to dabble in new ventures, but at least make sure those ventures might yield something worthwhile. Just as I don’t expect Michael Bay to helm the next Tree of Life, or Quentin Tarantino to tackle an adaptation of Charles Dickens’ Oliver Twist, I don’t expect Oliver Stone to turn in something like this. He knows better. Then again, even Ridley Scott has turned in some questionable output recently, so it seems like these ageing juggernauts don’t always hit the target. And to be honest, they probably don’t care either. Frankly, I’d rather they took the occasional chance than resort to what James Cameron has tasked himself with: abandoning all diversity and just dedicating himself to making Avatar sequels. Such a waste. This entry was posted in Review and tagged Aaron Taylor-Johnson, Benicio Del Toro, Blake Lively, California, Don Winslow, drugs, emsemble, John Travolta, Kickass, Mexico, Oliver Stone, Salma Hayek, Taylor Kitsch. Bookmark the permalink.